The June issue of her Nashville features Her Music City. This month’s issue highlights five successful women, Kay Clary, Virginia Hunt Davis, Kim Buie, Sally Williams, and Kylie Sackley, who have made a name for themselves in the music industry. These leaders discuss everything from their humble beginnings to favorite achievements including what it takes to be a successful woman in the music business today. The style section features members of Those Darlins, who earlier this year released their second album, Screws Get Loose, modeling the latest threads from several local Nashville clothiers. This issue also reviews some of the top organizations in the music business, including the CMA, NSAI, GMA and AMA. 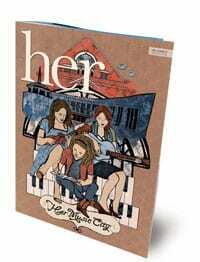 Her Nashville is a free monthly publication of Her City Magazine, LLC and is distributed throughout Nashville and Williamson County.